The music filled the beautiful church, St. Andrew’s in Highland Park. Pianist Linda Morgan-Ellison played Haydyn, Liszt, Schubert and Debussy Saturday evening. I can’t imagine the number of hours and weeks she had to practice the complicated pieces. She played expertly. The concert was dedicated to the memory of her friend, Bernadette G. Callery who passed away a few months ago. At the reception in the Parish Hall was a photo of her friend, propped up under a gorgeous bouquet of dark red roses. I was told the name of the color of roses was Black Magic. Lots of candles flickered in the window sills as some form of bubbly spirits was poured into stem glasses. There was cake, cheese and fruit to share after the recital. We were talking afterwards and my friend V recognized the first musical piece by Haydyn as the opening and closing credits for the 6 Part BBC Mini-Series Pride and Prejudice with Colin Firth. After the concert, several members of the audience gathered around the piano to try to figure out how she was playing from the iPad. Ahhh, there was a foot pedal to scroll to the next page of score. Her husband told me it was an app you could buy for $4.99, called forScore app. Amazing! We met another pianist, Henry Spinelli, who will play a recital at St. Andrews on March 16th at 3 PM. Friends of Music and the Arts at St. Andrews sponsors many free musical events throughout the year. The wordpress weekly photo challenge is Silhouette. When I hear that word I think of the little black paper cut- outs of children’s profiles mounted in a black oval frame. They used to be popular and hanging in homes. But yesterday I was photographing this display of bras created for October- Breast Cancer Awareness Month. The wind was brisk and it started to rain. The bras hung on a metal tree sculpture at American Eagle campus on the South Side, Pittsburgh, were blowing like flags. This photo is unretouched and is in color but looks black and white without any adjustments. Last year there were thousands of bras strung across the adjacent Hot Metal Bridge which I posted. A reminder to schedule a an overdue mammogram. A time to think of all of those who battle this disease, family and friends we know and love. It’s been closed a few years now. Well, the yellow sign says RELOCATED but that was temporary. I went to high school in Morristown, NJ so it isn’t my Alma Mater, but the empty building evokes a sense of loss. Last week when I was in Columbus visiting the family, I noticed my youngest granddaughter Maura’s baby dolls all lined up on the ottoman in the family room. There wasn’t much available light and the auto flash went off on the iPhone as I shot the picture. It wasn’t until I looked on the screen, that I noticed the middle doll’s expression on her face! I ‘d just been trying to capture the tidy line-up of little doll bodies. On the way back from getting coffee with a colleague last Thursday, before the evening session of Open House, S. showed me this statue. Today I returned to photograph it in the sinking October sunlight. As I drove home, I was thinking about a mother’s love for her child after spending a little time photographing the sculpture. Overbrook Boulevard and Ravilla Street intersection. Here’s a link to the story about how Boy Scout Troop 224 rediscovered this statue beneath vegetation, when just the head was showing through. I was filling up the tank and a stink bug started crawling up the car window. Caught his climb with the iPhone and the reflection of the parked car and building make for an interesting perspective. At least to me. He is definitely a bit soft on the focus but I still liked the composition. Plus he looks about the size of the other car! BIG! We got ice cream cones after supper at Jeni’s. Their salty caramel flavor is really good. There was a sign for a reverse root beer float. Of course, I had to ask…. 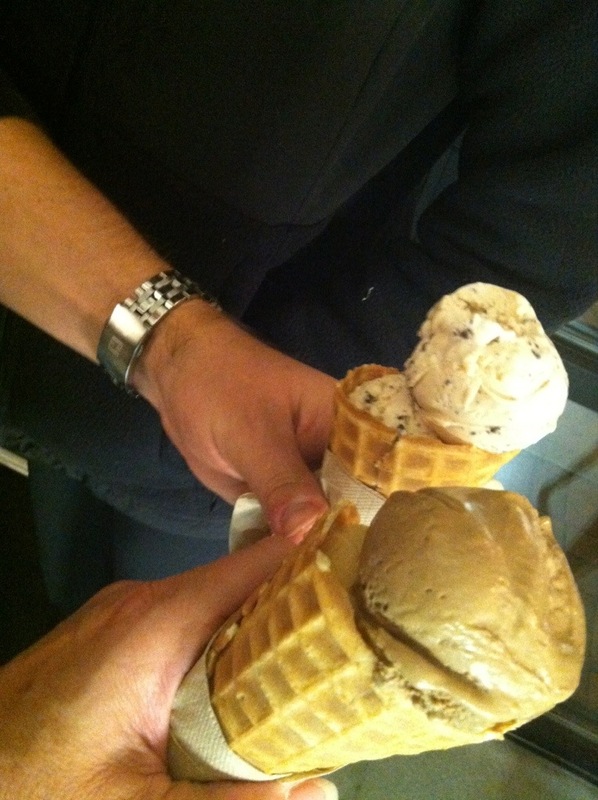 Cream soda and root beer ice cream. I had a scoop of root beer ice cream along with the salty caramel. Next time I will try the float!